Roger takes Pongo, his male dalmatian, for a walk when he sets his eyes on a young woman that also has a dalmatian, although a female one. Her name is Anita, and the Dalmatian is called Perdy. Pongo and Perdy fall in love in the same way as Roger and Anita do. Shortly after, Pongo and Perdita have 15 puppies, and Cruella de Vil, an old friend of Anita, visits them and offers them to buy the whole set of dogs. When they refuse to sell the puppies, Cruella finds other way of obtaining them: by stealing. 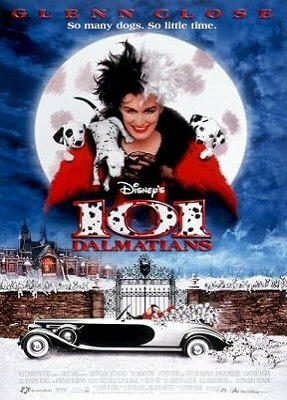 Along with 99 puppies in total, Cruella plans to make herself a coat and a hat made of Dalmatian fur.